This was another walk I did with Mick, and a glorious walk it was too, but as usual it meant an early start from home to get to the start at Sheldon, located about 4 miles west of Bakewell for a 9.30 a.m start. I often think the worst part of the walks is getting ready the night before and getting up very early in the morning to do a trip of a 100 miles or so to be ready for the start of the walk. Today was no exception but the weather looked good as Mick "raced" up the M1 to get us to Sheldon on time. Often some of the best walks we have done have been the ones that are least known. Often they are the friendliest as well. This certainly was no exception to that observation. So shortly after 9.30, with about 40 other walkers, we got into our walking rhythm as we went south-east from Sheldon past the Magpie Mine, which looked haunting in the early morning air. We crossed a number of fields and the main road between Bakewell and Monyash (home of the White Peak Walk) to get to the first check point at Over Hadden. From here it was downhill to the glorious Lathkill Dale. 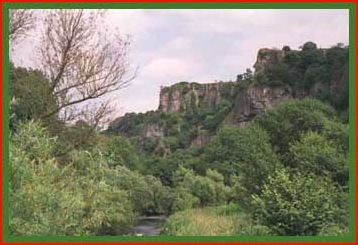 Lathkill Dale is beautiful. I can’t think of how many times I have walked it, but I always enjoy it. Although I have done it both up and down stream I think walking up stream is the best as the views of the waterfalls are so much better. Also the farther up stream you get the less crowded it becomes. 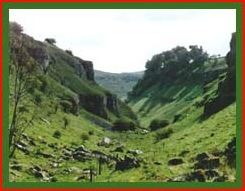 Near the top of "Lathkill", where Cales Dale joins it from the south, is a spot where a flower called Jacobs Ladder is supposed to grow. I’m not very knowledgeable about plants but my wife, who is quite an expert, always looks for it and to date she has never spotted it. However, we did see wild orchids. Hundreds of them grow on the slopes of what has now become quite a narrow valley. I don’t know what sort they are although if I remember right Mick, who is also a bit of a botanist, did tell me. Having reached the Monyash/Bakewell road again we were tempted to go into Monyash to the local store which sells massive ice cream cones. The ice cream is almost the same height as the cone. However, we felt we should go the correct way, which was actually a little bit shorter, and took a path that went north west around the top of the village. This brought us out on the same path that we take at the beginning of the White Peak Walk, which goes to Flagg and was the next check point of this walk. By now we had done 8 miles. The sun was shining and all was wonderful. However, this changed as we took the path that went via Town Head and on to Chelmorton. We were not having any problems with the navigation. The walk organisers had given us very good route information in the form of little sketch maps that were excellent. But we did have problems with flies. The last quarter of a mile before we got to the road near Chelmorton we walked through a field of long grass and disturbed hundreds and hundreds of little black insects that took a liking to Mick and myself. We, however, did not like them. They were awful and this must have been one of the few times I have run part of a walk, but run I did to try and escape them, and was very relieved to get to the road. But we had not lost them completely and for the next half a mile or so we were brushing them off ourselves but at least we had left the swarms behind us. By now it was time for food and I remember us "juggling" our rucksacks as we delved in them for our food as we carried on walking. Unfortunately the insects were still around as I bit into my ham rolls. They were certainly an untasty addition to the enjoyment of my lunch. The next part of the walk took us down Deep Dale. 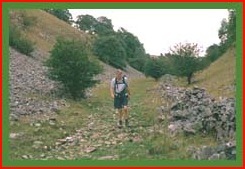 Now this is the Deep Dale to the west of Chelmorton. There is also one just to the west of Sheldon which we walked later in the day. Half way down this Deep Dale, which was lovely and not unlike the upper parts of Lathkill Dale, and also full of orchids, we clambered up the steep western slope to reach the road to the south of Kings Sterndale and the next check point. Unfortunately, somewhere here we took a wrong path and "hit" the road too far north and had to walk a couple of 100 yards south to get to the checkpoint before retracing our steps. As it turned out we were not alone and, as we went north towards the A6, met others who had also gone the wrong way. We crossed the A6 and were given instructions by a marshal to continue north up the hill in front of us before going eastwards towards Chee Dale. By now we had completed about 13 miles, it was getting warmer and this hill was the steepest one we had tackled today. 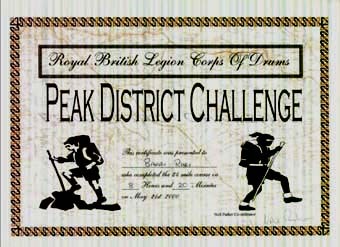 It was therefore a relief to reach the top of it and before too long we were going downhill towards Chee Dale. This was our favourite part of the walk. 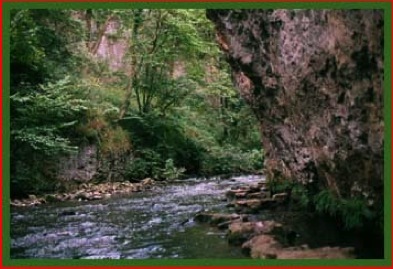 We travelled along this wonderful gorge cut by the River Wye going through the aforementioned Chee Dale and enjoying the experience of walking the stepping stones that is the footpath as the river passes through the steepest part of the gorge. It was wonderful and I have walked the stepping stones twice since then, one of the times being with my wife when it was raining and the route was almost under water. A wonderful, but slightly worrying, experience. From Chee Dale to Millers Dale and then we climbed up to Priestcliffe. This was the part I had been dreading all day. Having studied the route before I knew we were in for a climb. We were not disappointed and it was with great relief that we emerged from the woods that shrouded our steep ascent and walked across fields to Priestcliffe and the next check point. We had now done over 17 miles. We had almost finished! From here it was along the track to Bull Tor and soon we were going downhill again to meet the Wye at Litton, which we followed to Cressbrook. Here we crossed over the bridge to get to the last check point before following the route of the old railway track to the Monsal Head Viaduct. At this check point I met an old friend, a St. John’s ambulance lady affectionately known as "Vaseline Val" - I think her name is actually Diane. I had first met her some years before on the White Peak Walk when my feet were feeling "uncomfortable" at the Bakewell Check Point, about 11 miles into the walk. The beginning of blisters I thought. "Val" also thought the same and without more ado she whipped off my boots and socks and smothered my feet in Vaseline. The Vaseline helps to reduce the friction between the foot and the sock and as the friction causes the blisters the Vaseline helps to prevent them. And it really does work. I have now done at least 10 challenge walks when I have used Vaseline on my feet before the start of a walk and have never had the discomfort of blisters. Anyway we still had a few miles to do so it was farewell to "Val", who incidentally has done the "Chatsworth Challenge", and off we go once more. On reaching the Monsal Head Viaduct we left the Monsal Trail as our route took us downstream along the Wye to again meet the A6. We crossed this and entered Great Shacklow Wood, continued into the second Deep Dale before leaving it to walk the remaining mile or so to Sheldon and journey’s end. We had, if I remember right, a supper of sausage and mash, and unusual for me I did not finish it, as I felt too tired to really enjoy it. However, I’m sure Mick devoured his portion and the pudding that followed before we returned to the car and started our journey back to Warwickshire. We certainly never broke any walking speed records that day. The 24 miles had taken 8 hours and 20 minutes. But it had been a great day, except for the insects.